Authority is something that needs to be earned. If you think that you can just stroll onto a ship and take control of the crew of sailors, you’ve got another thing coming. You need to have the right attitude to gain their trust and respect. You need to show them that you have everything under control. But, most importantly, you need to be wearing a captain’s hat. Yes, the mighty captain’s hat! It tells everyone that you’re one to be trusted. It lets everyone know that you can steer the ship to calm waters. If you want the entire crew shouting, “Aye, aye, mon’ capitan!” to your every word, you’d better be wearing one. 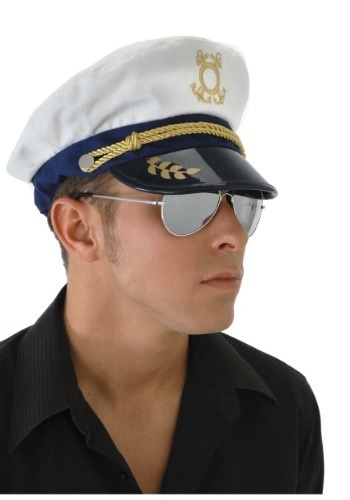 This sailor captain’s hat helps give you the look of a true captain. It’s made of a polyester and cotton blend and has a vinyl brim. The hat is white with blue trim and has an embroidered anchor, rope and leaf on it. Just toss this happy little hat on your head to make sure that your wily crew obeys your every order. Be sure to check out our many sailor costumes to help you cultivate the look of a rugged sailor for your next costume party!